Garnering praise, mockery, and even contempt, Damien Hirst has produced art over the last three decades that can be described most succinctly as controversial. He is best known for his large installation pieces, particularly those of dissected animals suspended in formaldehyde. Hirst also deals with religious themes and ideas, such as The Incomplete Truth (2006) which shows a white dove with outspread wings suspended above nothing and God Alone Knows (2007) which displays three crucified cows in the manner of Christ and the two thieves. Like these two pieces, which question the reality of Christianity and the violence of the crucifixion, much of his art criticizes the Church. However, some of his critical work can be interpreted positively, like his highly praised sculpture The Virgin Mother (2005). While meant to critique the idea of a young impregnated girl, it can also be understood as underscoring the reality of an incarnated God. However unsettling and harshly critiqued, Hirst’s artwork is consistently thought provoking. One of his most recent sculptures, Fallen Angel, beautifully engages with the question of repentance and redemption. Completed in 2014, Fallen Angel was shown at Gloucester Cathedral’s sculpture exhibition, ‘Crucible2.’ Hirst’s piece depicts Mary Magdalene in a posture of penance. This representation of Mary Magdalene, known as the ‘Penitent Magdalene,’ is one common in art history and has been portrayed most famously by Donatello, Titian, Caravaggio and Georges de la Tour. Hirst’s Magdalene is inspired by and copied from Antonio Canova’s neoclassical sculpture completed in 1796. 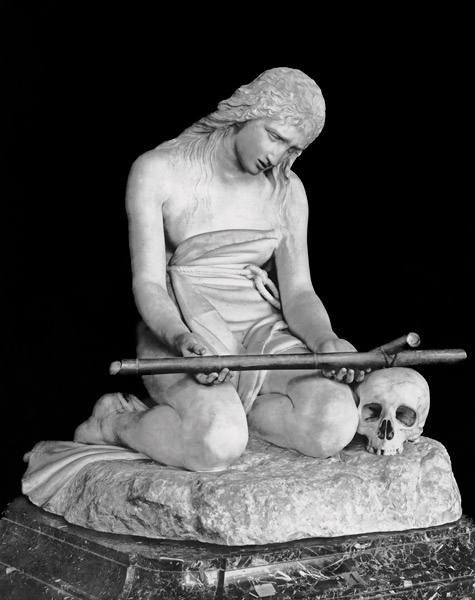 While Hirst’s Magdalene adopts the same pose as Canova’s and both have the traditional iconographic skull serving as a memento mori (a reminder of impending death and an impetus for repentance), Hirst makes striking changes. While Mary Magdalene, due to the influence of Pope Gregory I, is commonly understood as being saved from a life of prostitution, Hirst, though implying this, attempts to modernize the saint by portraying her as struggling with drug abuse and suicidal thoughts. Along her beautifully gilded arms, Hirst imposes self-inflicted wounds and above the elbow of her left arm we see a cinched elastic band. The signs of drug abuse are verified by the needle and spoon found by her right knee. To further emphasize her dejection, across her stomach are carved the words: ‘LOVE ME.’ Yet this ‘fallen’ Magdalene is not without hope. This is strikingly conveyed by the most obvious change Hirst makes to the traditional iconography of the Penitent Magdalene—the remarkable set of wings given her. They rise gloriously from her fallen body, pointing heavenwards. The possibility of such hope and redemption is shown in Canova’s sculpture by the wooden cross held by the Magdalene. Hirst’s Mary comes empty-handed, but powerfully shows her crucifixion to the world by the tree upon which she leans. Its partial branches frame her penitent pose. If the wings are not suggestive enough, Hirst has plated the bronze statue in pure gold. This is interesting in light of Hirst’s recent series called ‘Kaleidoscope Paintings’ produced between 2001 and 2008, which evoke stained-glass windows but are made purely of butterfly wings. Hirst recalls a person telling him how unfortunate it is that a butterfly’s beautiful wings are met in the middle by a repulsive hairy body. While his ‘Kaleidoscope Paintings’ utilize the ‘beautiful’ portion of the butterfly, it is in Fallen Angel that Hirst seems to suggest that beauty can be attained despite the repulsive hairy body of human sin and ignorance. Mary Magdalene experiences such a transformation through the permeating grace of God. 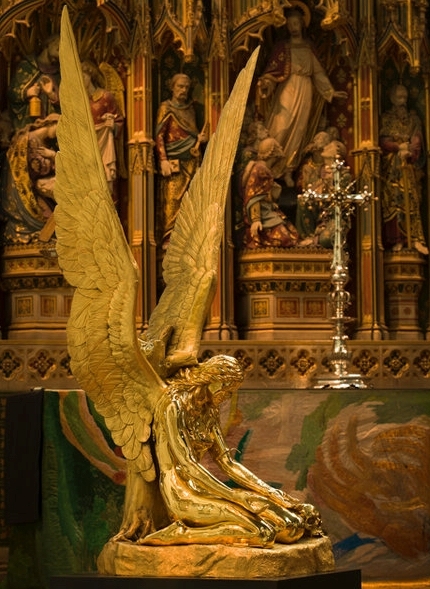 It is the tension between her austere condition and beautiful winged representation as well as her exhibited position near the High Altar that challenges conceptions of what it means to be redeemed, to be a saint, and to be holy. Damien Hirst: Fallen Angel, 2008-14, 65.2 x 34.6 x 27.4 inches (166 x 88 x 70 cm), gold-plated bronze. © Damien Hirst and Science Ltd. All rights reserved, DACS 2015 c/o Pictoright Amsterdam. Damien Hirst (b. 1965) is a British artist known best for his installation artwork. A member of the Young British Artists (YBAs), he rose to fame in the 1990s with his installation pieces A Thousand Years (1990) and The Impossibility of Death in the Mind of Someone Living (1991). Hirst won the Turner Prize in 1995 and is often considered one of the most important artists of the twentieth century. Crucible2. To see more of the exhibition of contemporary sculpture at Gloucester Cathedral in 2014, featuring 100 works of art by 61 sculptors, many of them internationally acclaimed artists, go to http://www.crucible2.co.uk. Kevin Burns is currently studying for his Masters at the Institute for Theology, Imagination and the Arts at the University of St Andrews, Scotland.